Original and exclusive printable Valentine's Day cards from Kate.net! These printable Valentine cards are © Kate.net, and the Original Artwork drawn by and © Kate.net. These cards may be printed for personal or school use; however, they may NOT be offered or distributed elsewhere in any format (may NOT be distributed on any other web page; may NOT be distributed in any digital format whatsoever; may NOT be distributed to others in print format or in any other format), whether commercially (for a fee) or for free, NOR may parts of these cards be modified or used in other graphics in any format. 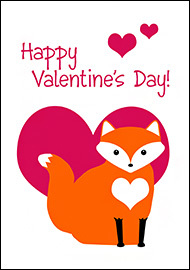 Neither these cards nor portions of these cards may be printed for commercial purpposes or printed for any other purpose than as exchangeable Valentine's Day cards. You may NOT link directly to these downloads; however, you are welcome to create a link to this page's URL. Thank you! In order to download these cards, which are in PDF format, you'll need the free Adobe Acrobat Reader. Most people already have this on their systems. Click on the image desired to load the PDF file, then print. See copyright and usage information above before using these cards. them on lightweight cardstock, although regular paper should work, too. After printing, just cut out on the lines provided. Copyright © Kate.net. See copyright notice near top of page.